Being born and raised in Philadelphia I believe I have seen some horrible Phillies teams. Even New York Mets fans can relate to that after being through their inaugural season. Those teams fail in comparison to the 1916 Philadelphia A’s. After a final record of 36 wins in a 154 game season, they secured their spot in history. Which brings us to today’s book…. Connie Mack, the grand ol’ man of baseball was obviously at the helm of this lackluster team, and even he could not work his magic on this team. The odd thing about this team was the fact, that in the first half of the decade they were a team of great success. Perhaps they were cursed, perhaps the penny-pinching ways of Mr. Mack was catching up with them or maybe some undisclosed curse of the A’s in Philadelphia. Whatever the reason was, this team was horrible! This book starts out giving you some background on the Philadelphia Athletics and some of the triumphs they had in years prior. The authors then break down a month by month recap of the 1916 season including spring training. This team seemed doomed from the get go. Finally, the aftermath of the 1916 season and the lasting effects were analyzed as to how they effected the subsequent seasons in Philadelphia. Except for a few seasons of success here and there, this was the first signs of an almost cursed franchise. Personally I think the A’s were the worst team ever. I know to some degree it has been debated in the baseball realm, but based on winning percentage the 1916 A’s win hands down………hey the A’s finally won something. I also think it was the result of Mack’s penny-pinching that resulted in such a bad team. These type of financial moves hindered Mack for most of his remaining time in Philadelphia. Usually books pertaining to this era, I have some trouble getting through, but that was not the case with this one. The authors were very structured and each chapter was well thought out. The two authors who hail from Canada were also very well versed in Philadelphia Athletics history. 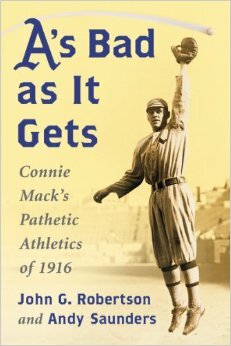 The relevance of this book shows in the fact that there still has not been a team that played worse than the 1916 A’s almost a full century later. All baseball fans should enjoy this book. It sheds some light on an important benchmark that still stands with in the game to this day. I honestly feel that this record will never be broken. With the quality or lack there of in baseball today, I just don’t see it being possible. You can’t lose them all in reality.